Find hotel near Cotswold Wildlife Park An .. 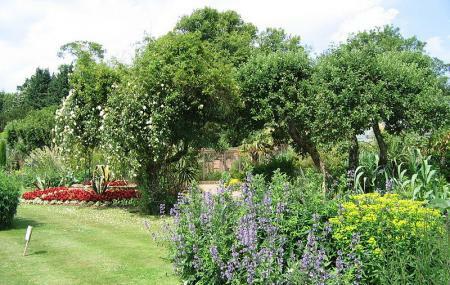 The Cotswold Wildlife Park and Gardens is one of the most beautiful attractions in the country where you would be able to observe over 260 species of wildlife. Covering an area of 160 acres, most of the animals that call the wildlife park their home are endangered and rare. You could walk through the Madagascar enclosure and observe free-roaming lemurs while penguins, meerkats and tropical birds can be seen in the Walled Gardens that has been exotically landscaped. Other animals that can be observed include outdoors lions, rhinos, giraffes, anteater while indoor exhibits include Invertebrate House, Reptile House, Farmyard Barn and more. Wander around observing the various animals at Cotswold Wildlife Park and Gardens or have a little picnic with your family. Fabulous experience of seeing wild animals up close in attractive habitats. My little loved stroking the goats and the ponies as well as being awestruck by the beautiful white rhinos and cheeky penguins. The adventure playground was also a super bonus for burning off some energy. Didn't get to see everything but we will definitely be back for some more! Visited on Good Friday. Glorious weather meaning the car park was packed to capacity. However, the grounds are nicely spread out meaning that it only felt very busy when entering the indoor exhibits such as the reptile house. Lots of amazing animals on display and the gardens were looking beautiful too. Great value full day out at only £14 per adult online. Great place to visit for the whole family. The kids loved seeing all the animals and hearing the various talks about them. There is a great restaurant which is reasonably priced. My little 5 year old also loved the adventure play area which goes up into the trees and has some great slides. Will definitely be visiting again. There are not enough hours in the day to see and appreciated all of the animals and fascinating exhibits here. Truly an amazing park, be prepared for a good walk, but every step will be worth it. This is the wildlife park that all of the other should be judged against. All of the staff are knowledgeable, approachable and friendly. The animals have plenty of room to stroll, play and feed, they all looked happy and contented, and to see so many up close is an amazing experience. Wonderful! Amazing day out for the family. We travel here every year and always have a great day out, there is a great range of animals and some truly brilliant enclosures which bring you right next to them. There is an amazing adventure playground, train and plenty of picnic tables all around the park. Would thoroughly recommend. There are lots of kids about, but plenty to do as an adult too.